There was a time when I thought Pocket was the second best option for all the articles I was used to clipping into Evernote to read later. I do not think that anymore. I’ve found that over the last three years I’ve read more of the stuff I’ve saved in Pocket and it is easier to keep up with too. Most of the things I read, I discard after the fact. What I don’t discard, I archive in Pocket. My archive in Pocket is very small. Overall, Pocket has been the best thing to come out of my switch from Evernote to OneNote. 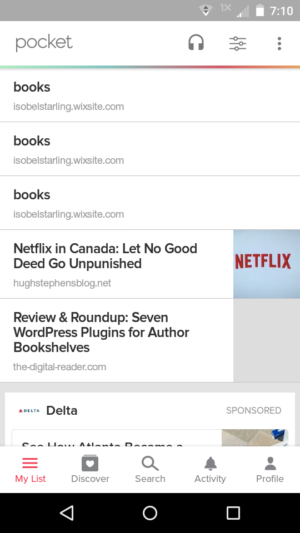 Pocket has become my first choice for reading saved articles. OneNote isn’t optimized for reading, and I never have been able to use it the same way I used Evernote. But that’s okay. Pocket is compatible with every device I have, still–even the oldest–beating out both OneNote and Evernote. (Joplin has a very nice interface for reading articles, but I haven’t installed the web clipper extension and I’m not sure I want to). Pocket has been the perfect tool for collecting reading material to read in my spare time. And that brings me to my 2019 goal to read fewer articles in Pocket. :D Yes, it’s weird. But I’ve gotten this little notice three years running now, and I don’t want to get it again. Let me explain. 1. I read too many random articles I find on the web. 2. I’m wasting a lot of good reading time doing it. 3. I’m cluttering my brain with repetitive information I don’t need, and what happens when you repeat things? You remember them, they become habits, and you get stuck in a rut. No joke. For example, I might send ten articles about, oh, I don’t know, procrastination to Pocket, and then read them all, even knowing the chance of me discovering or realizing anything new from them is infinitesimal. It all comes down to this: I am wasting good brain power going over the same things time and again, when I should be reserving that time for deeper, longer, more meaningful learning on topics I haven’t already studied to death. 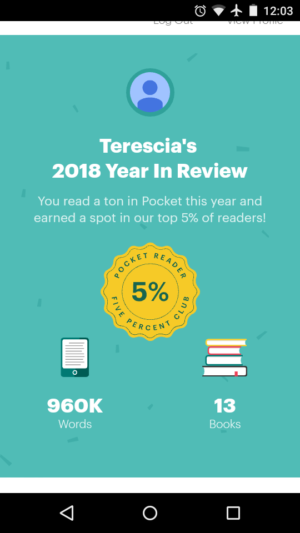 So that’s my number one reading goal for 2019. Well, it was a good run. I used to enjoy reading The Passive Voice blog for the publishing news and stuff, even the random bits that didn’t really have a lot to do with publishing or self-publishing. I have been visiting and reading the site for more than six years. But The Passive Voice has been in decline for a while now. Of late, the blog has been awash in political wrangling and the comments a chore to read. A few frequent commenters have taken over the comments section in the last several years and their diatribes and viewpoints are just not to my taste. It’s a chore to talk to people about things that can be divisive and come away from those conversations still friends, or at least friendly. But it’s a hell of a lot more likely to happen in a real world conversation than in an online one. Discussion of divisive topics online has become a no-go for me as I’ve realized how much of a waste of time it is. Even people who are nice, easy to talk to people in real life often act like total assholes online. I am now saving all these types of conversations for people in the real world whom I respect or who can at least treat another human being with a bit of decency. Anyone else can stuff it. I’ve successfully cut out the writer forums I used to visit and my enjoyment of writing and self-publishing has improved dramatically. I think it’s time to cut out The Passive Voice too. I’m kind of thrilled by that decision. Stopping my visits to the forums has been a surprisingly effective mood booster. Even if this is just a blip compared to that, it can only help. I liked that this article gave me some interesting ideas about why I might be a “good reader” even though I actually read pretty slowly. I do tend to comprehend what I read, but there are times when I question how I think of myself when it comes to reading. Just yesterday I read an article online that required me to reread a paragraph about four times before I felt like I knew what the heck it was saying! Maybe it’s simply that I’m trying to make connections with knowledge that’s full of gaps. See that “books”? Those are supposed to be posts/pages on that site, specific pages that I wanted to read. “Books” is the site homepage, and if you chop it off books like lots of people do (myself included) to get to the main author site, you don’t get a page at all. You get a 404 error. Now that could be the author’s problem, maybe they set up the site wrong, but the thing I’m concerned about, for every person out there who might be using Wix as a website, is the fact that individual pages are not viewable in things like Pocket. Every page I had saved was just like this. Blank. I’m blaming Wix for this because Wix supplies the templates. Isn’t that the whole point of Wix, to make it easy for people who don’t know how to make a website or just don’t want to fool with the details? Now I have to go try to remember what pages I wanted to read and find them again. Or if it’s even worth the trouble. My suggestion to anyone considering Wix for anything as important as an author website is to skip it. Wix does not function the way it should. It warns you for politics, but it really isn’t political. It’s about being human. It’s 8:14 am, I have my hot honey lemon water next to me, and my computer set to power saver mode to maximize the battery. I did get up early again today but I’ve been dragging a bit. NPR.org is definitely going to have to go onto my no read list for my web reading challenge. It’s turning into a crutch for me when I’m seeking out easy distractions. Oh, and I added the WordPress app to my phone and it’s so much easier than using the phone browser, despite how good the mobile site is. I’m very happy with the change so far. Mornings are when I expect to have my most difficulty with this web reading challenge I’m doing. I tend to spend a lot of time in the mornings settling into the day reading this stuff. I didn’t have any trouble at all this morning. Haven’t even been tempted. Stopping myself from clicking certain things by habit wasn’t even a problem, because last night I deleted all my bookmarks and history from my devices for the particular infotainment sources I want to avoid. 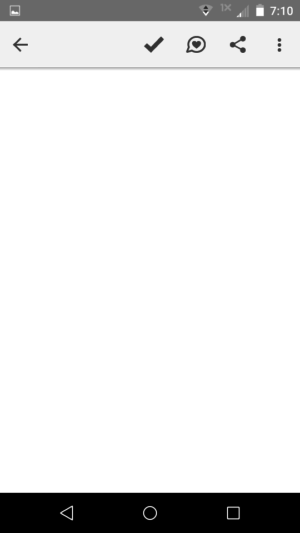 Not clicking the trending tab in my Fire tablet was a little more difficult, but I gave it the side-eye and moved on. I’m pretty happy with myself at the moment. I haven’t cut out all web reading, by the way. Just stuff that I associate with addictive patterns. For example, the Dean Wesley Smith blog. I don’t know that I’ve ever seen DWS post more than once a day and the comments on his site are moderated and he seems to only let them through once a day too. No addictive behavior rewards there, so I’m not worried about taking a peek at the site while I eat my breakfast, which I did. In other words, once I’ve visited, there’s no point going back! Am I worried about slipping into a habit of visiting twenty blogs that are only infrequently updated and basically recreating the thing I’m avoiding? No, because I’m just not going to do that. I’m not trading one web reading addiction for another. Full stop, not going to happen.